As a performing artist it is at times challenging to do what you love the most. 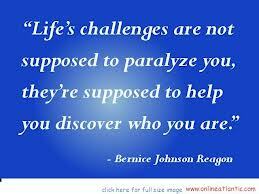 There are obstacles that can hinder your process and impede your progress! There is the obstacle of self-doubt. This is the biggest and most damaging to any dream or goal. When you doubt your ability to believe in your talent it is very difficult to take the first step toward success. You must believe in YOU! Another obstacle is jealousy. The green-eyed monster of haters! Haters come in many disguises. The most obvious is the one who pretends to be your friend. These so-called friends will publicly sing your praises, while secretly hating you, therefore undermining your progress. It is time to assess those around you! Yet another obstacle is the economy. When the economy is in a downturn, the first thing to go is the budget for the arts. It seems the powers that be never recognize the need to keep funding for the most important thing that will help our young people to stay focused and become productive citizens in society. The failure to activate the mind of our youth only lead to greater obstacles that hinder progress to doing what you love! These are just three obstacles. I’m sure you can think of many more. However, when thinking of the obstacles, let’s think of ways to go over, through or around them to meet the challenges of doing what we love! © 2013, Tammy Denease. All rights reserved.